Here in North Idaho, winter is never far from anyone's minds, no matter how hot it is (and right now we're gasping in the low to mid-90s). 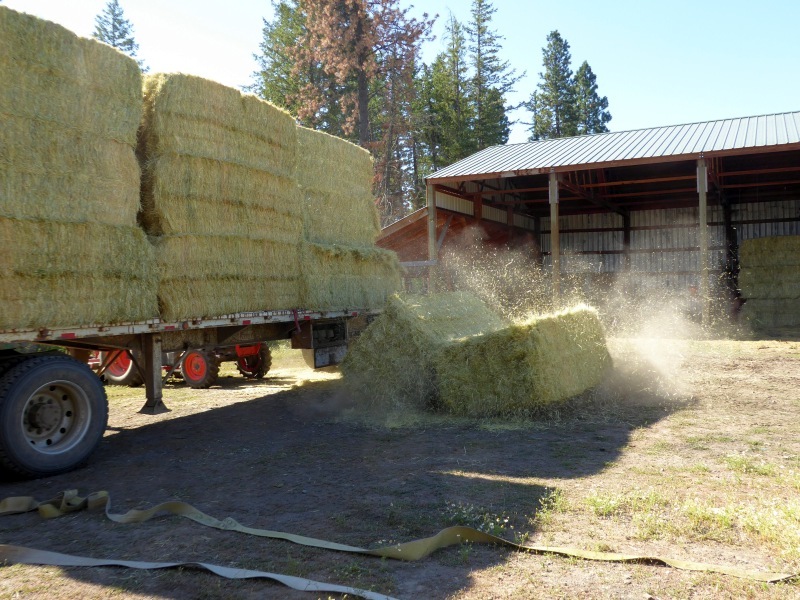 Yesterday we took the first step toward winter preps by getting our hay in. We have a neighbor who always keeps an eye out for a good deal on hay. This year he found some bluegrass for a very affordable price, so we ordered 15 tons. The driver was able to fit 24 bales (12 tons) on the truck at a time, and we'll pick up the remaining three tons ourselves. 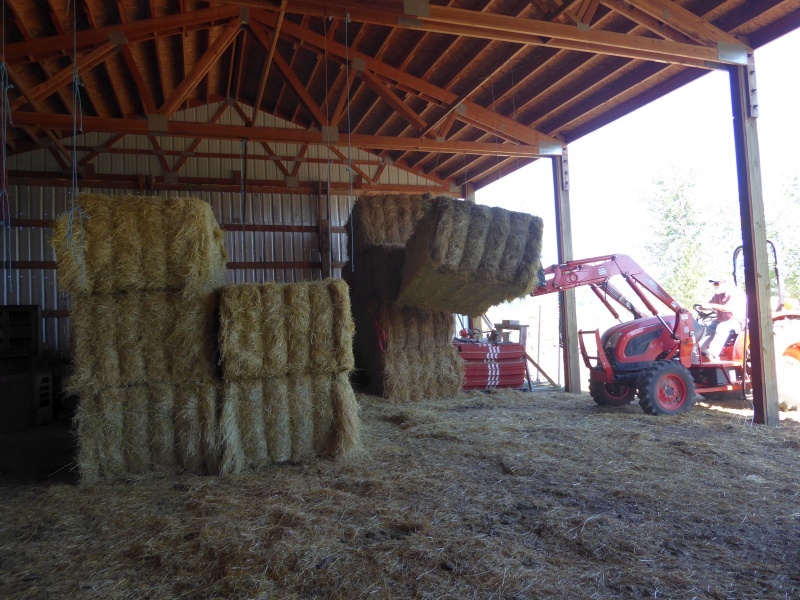 So all day Thursday we cleared the landing in front of the barn, and cleaned up the barn as well to make room. At 9 am precisely yesterday morning, the truck rumbled up with our hay. 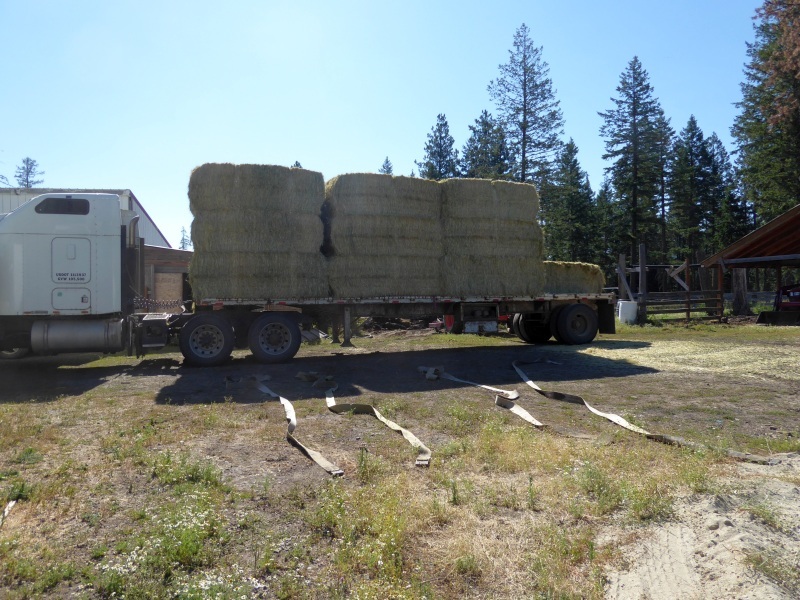 It only took the driver about a 12-point turn to get his rig turned around in the landing with the back facing the barn. Okay, maybe it was a 16-point turn. Don had borrowed a neighbor's tractor with a lot more oomph than ours -- it's capable of lifting 1000-lb. 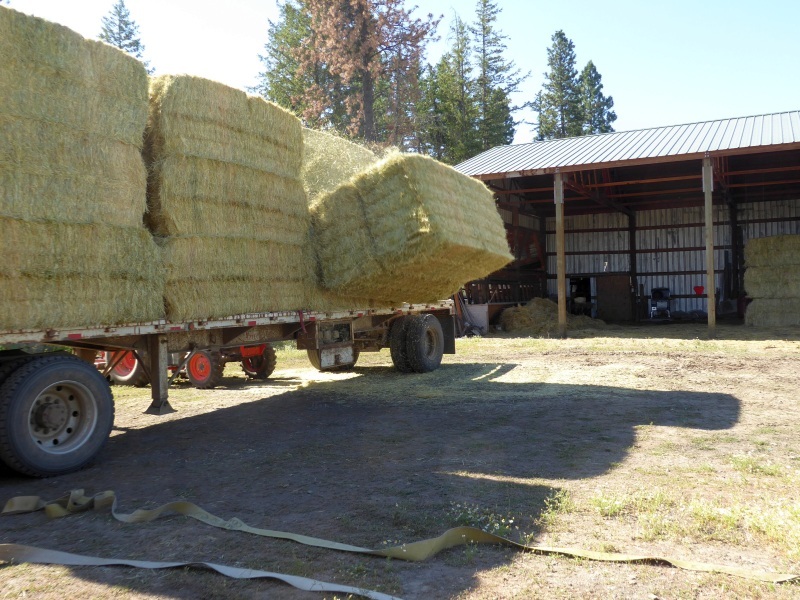 bales easily, plus it has tines -- and he handled it like a pro. Since we're only getting 15 tons this year (as opposed to last year's 30 tons), he only stacked them three high, instead of four high. We still have two tons left over from last winter, plus we're butchering three more animals this fall, so we'll only go into winter with six cows to feed (and a horse). (In case you're wondering, the animals we'll keep are Matilda and her yearling steer calf Sean, Amy and her yearling steer calf Armour, and Polly with her yearling heifer calf Pixie). 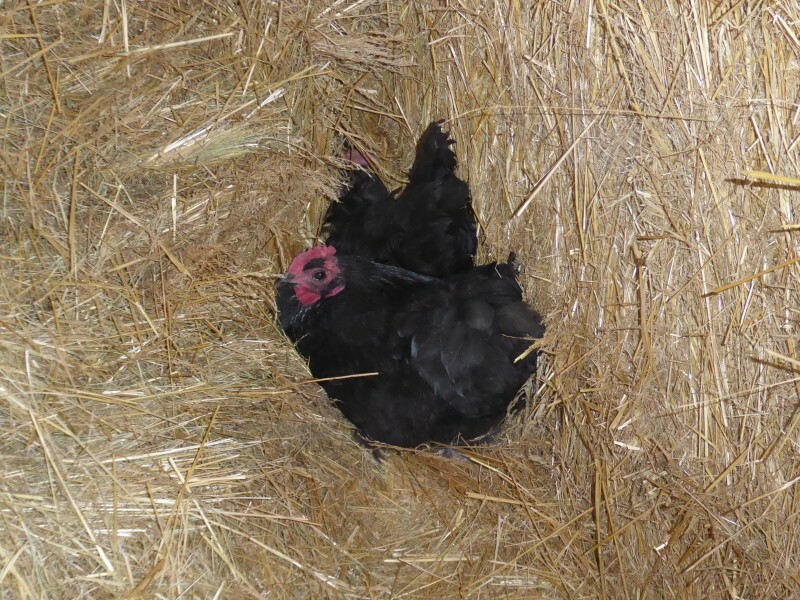 While Don was stacking hay, I checked on a hen I knew was setting in a corner by the older hay bales, and made an interesting discovery. Two hens are setting on the same nest. What, ladies, there isn't enough room around here for separate nests? I tell ya, I've never seen a breed more likely to go broody than these Jersey Giants. I have no idea how many eggs are under them, nor do I have any clue how they'll sort out whatever chicks hatch, but I figure that's their business. 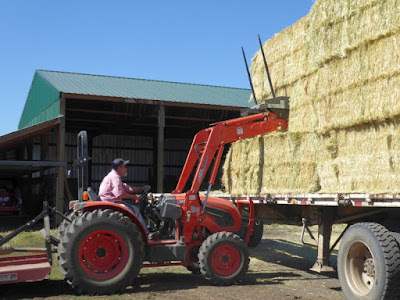 After unloading the first six bales, Don learned the easiest thing to do was get on the other side of the truck and shove the bales down. It's a pretty impressive whomp when thousand-pound bales hit the ground, let me tell you. You'll notice there's a lot of room behind the bales in the barn. There's a reason for this. We had a bull calf who -- ahem -- came "online" sooner than anticipated, so it seems all the girls are bred and will calve sometime in late January or February. That's a really really lousy time to have babies. However we'll only have a maximum of four calves born, so we'll shuffle everyone into the barn or outside pens to keep them protected from the weather. Matilda and Amy can bunk together (they are mother and daughter) in the pens by the corral, and Polly and Pixie can bunk together here behind the hay bales, where they'll be sheltered from wind and snow. Ah, logistics. 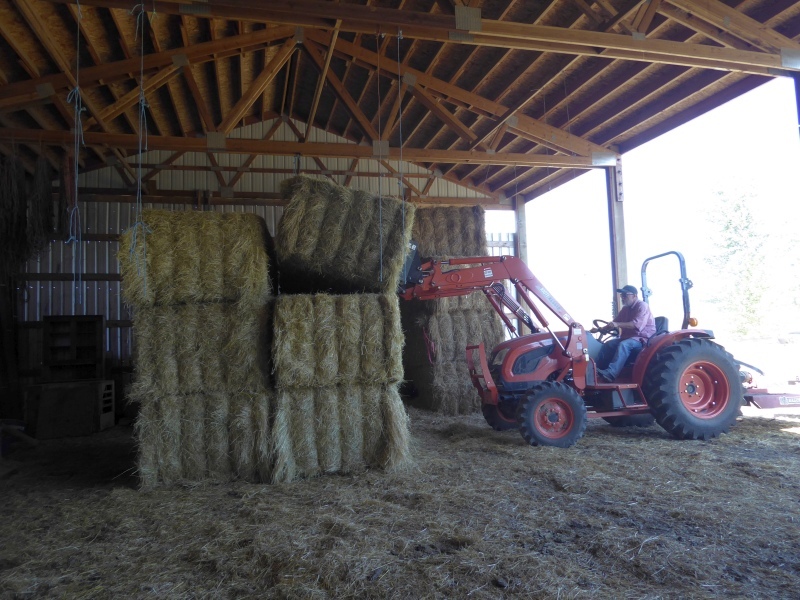 This summer milestone -- getting the hay in -- is one of those "Whew!" feelings of security, knowing we can feed our animals through the winter. Years ago, I worked at a Red Rose Feed store, just then purchased by Carnation. The place had a moderate-sized lot with no right angles to judge by, You could always tell the mountain drivers from the plains drivers. The mountain drivers usually just pulled in and then backed up to the dock. The plains drivers, mostly used to just pulling under the tipples of grain silos, took from 30 to 60 minutes to get to the dock. I know it was frustrating to them, but it entertained us. 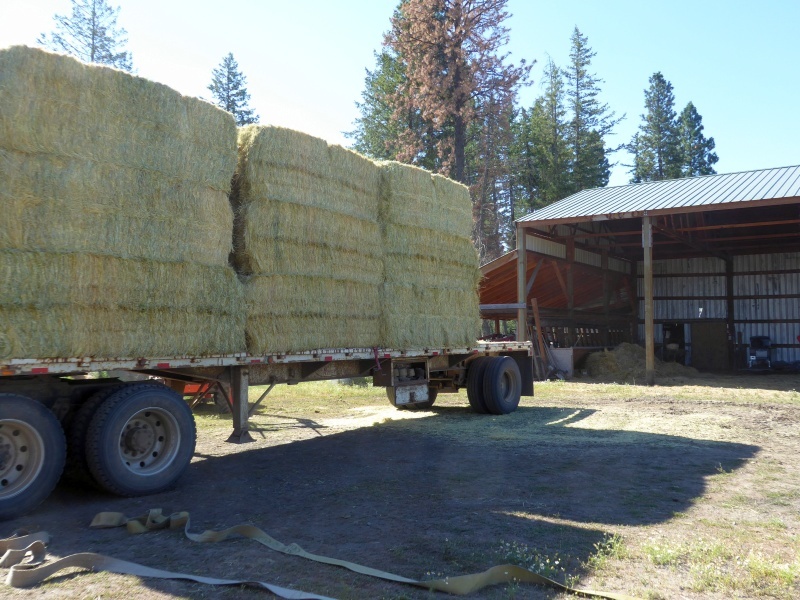 So what is a good price for a ton of hay now? I wonder because I see many trucks hauling hay from Central Oregon West into the valley. It must cost a small fortune to do that. It kind of relates to one of my pet peeves. 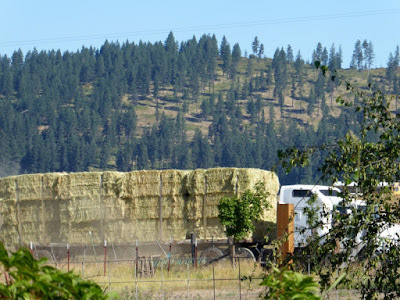 We see log trucks all the time traveling miles and miles in one direction to their mill while at the same time seeing other log trucks traveling miles and miles in the opposite direction to their mill. Seriously hasn't anyone considered a way to bring them to the closest mill and split the profits or at least find a way to break even on the board feet while saving on the transportation? But wait, there's more transportation stupidness. 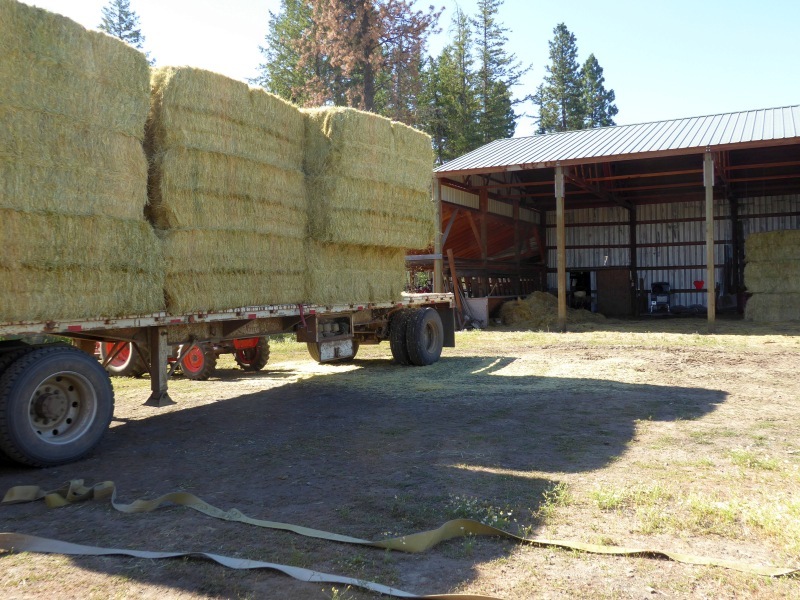 I see flatbed trucks that travel 500 to 1000 miles carrying bales of scrap cardboard. Seriously the cost to transport it must be more than the value of scrap cardboard. In this case the bluegrass was $60/ton, or $70/ton delivered. 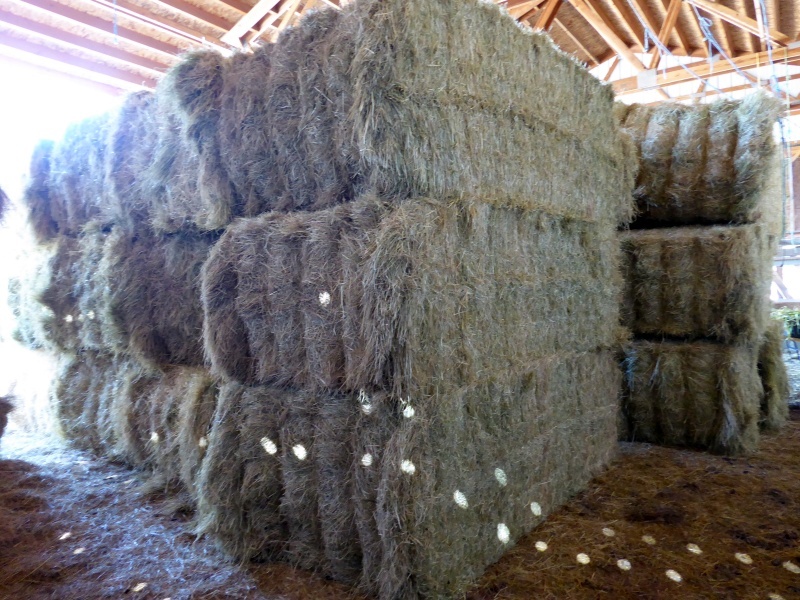 The hay came from a farm about 15 miles away. I can't comment on other trucking issue. How much hay do you expect your cows to eat in a normal winter? We plan on one ton per cow per month. My skinny little Jersey can eat a ton of hay, by herself, in one month and we start feeding after the first hard freeze- usually at the end of Aug or beginning of Sept. So I plan on 9 tons just for my little milk cow! We plan about two tons per animal for the winter, plus some extra just in case. Seven animals (that includes the horse) = 14 tons. I am always thrilled when you put up the hay post. Autumn, my favorite season is on its way! My daughters, who are 10 & 12, read your posts. They call you the farm lady. I remind them you are Mrs. Patrice but all they remember is the lady with the bee's. It brings me joy when they ask to read your site before they go off to bed. You bring them a lot of joy. Me too! Glad to hear Matilda is hanging around! I've been pulling for her. Ever since her "near death" experience! My operation required exactly one bale of straw this year as bedding for my gardens and my wife's flower beds. I'm expanding next year so I might need two bales of straw. If I can purchase the miniature donkey that a local Mennonite family has for sale I'll need to buy actual hay.